A developer wants to build an 11-story building that opens out onto Transmitter Park. GREENPOINT — A developer's bid to have their building's lobby open directly onto Transmitter Park has infuriated neighbors and park advocates who fear the luxury property will use the public park like its front lawn. The group Friends of Transmitter Park is demanding that the city require the developer of 13-15 Greenpoint Ave. to fork over funds for park maintenance and keep a 13-foot wall dividing the park from the building if it plans to agree to the developer's requests at the site. 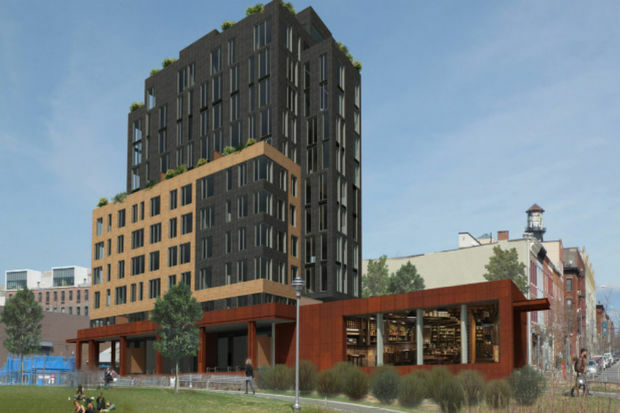 Beyond making the building face the East River and Transmitter Park, Kent/Greenpoint LLC, backed by BNS Real Estate, wants to build one wider 11-story building instead of two narrower ones, and needs the city's approval for that measure as well. "The community hates the whole project, but it's a lesser of two evils if we have to live with [it]," said Steve Chesler of Friends of Transmitter Park, adding that if the developer is going to have only one tower next to the park, at least it should open out onto Greenpoint Avenue like the rest of the buildings on the block. As is, the developer's plan will, "feel like we're trespassing on someone's private property," he added. Currently the developer can build a skinnier 14-story building and adjacent 7-story one on its development site, according to documents filed with the Department of City Planning. 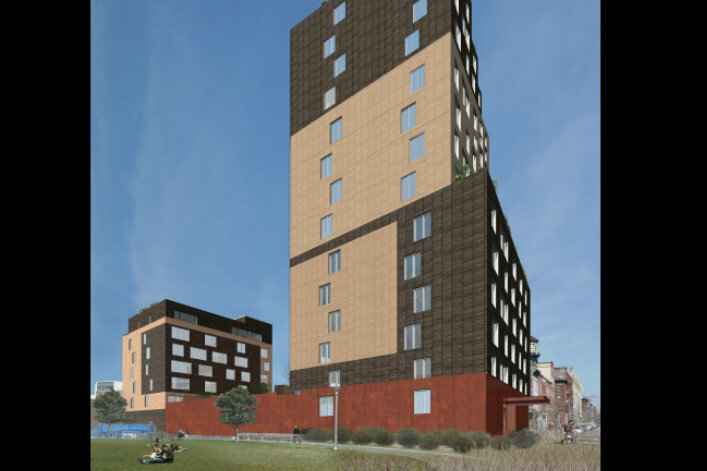 Lifelong Greenpoint resident Konstancja Maleszynska, an organizer for the Open Space Alliance, worries that unlike most buildings located near parks, there's no street in between Transmitter Park and 13-15 Greenpoint Avenue where the 11-story tower is slated for construction. "It's practically a front yard," she said. Friends of Transmitter Park detailed their requests in letters sent to the community board and the borough presidents office, which makes recommendations to City Planning on changes. The community board, which has an advisory role in the land use process, voted down the developer's plans at a Tuesday night meeting. While the changes would help temper the impacts of the park-side tower, one resident worried that with or without them, the tower will be a "behemoth" casting shadows over the park. "There's going to be this huge beast separating us from the city," said Maya Marzolf, 39, who owns a building on the block and lives around the corner. "That beautiful skyline, that air coming from the river, it's all going to be gone." Attorneys for Kent/Greenpoint LLC didn't return a request for comment immediately. This is what the developer can already build without any zoning change.